Start your engines, I mean day, with this tasty Sugar Free White Chocolate Hazelnut Butter Coffee. 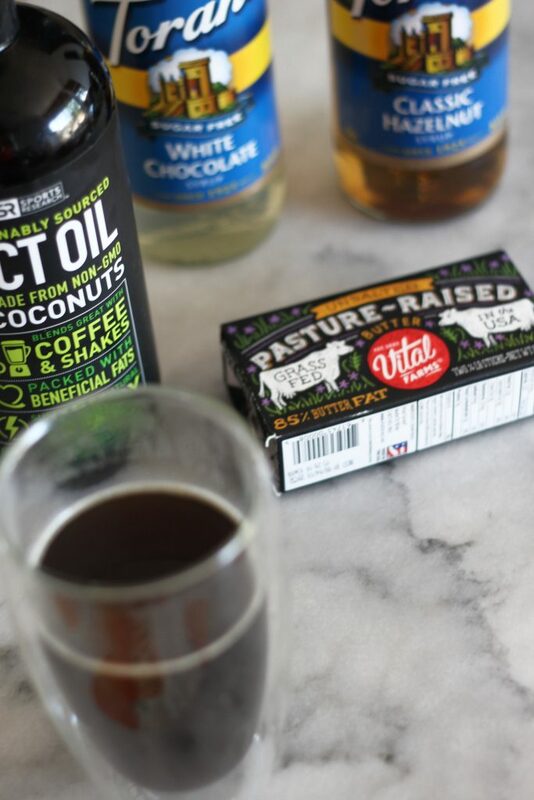 With a burst of high-quality fats, the jolt of coffee and the flavor of Torani Sugar-Free Syrups, you will have the low carb coffee of your dreams! About a year and a half ago, when I was just getting back into eating low carb and keto, I drank a butter coffee every morning. You might know butter coffee as keto coffee or bulletproof coffee. I just call it butter coffee. I loved it, but as Arizona does, it just got too hot to have hot coffee every morning. Butter coffee is great because it gives you a ton of energy and keeps you full and has zero carbs. 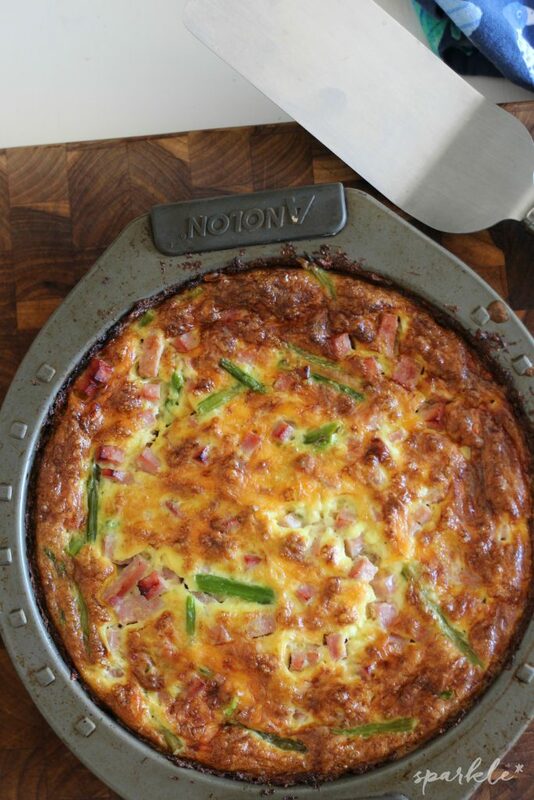 It’s also great if you have a hard time getting all your fats in for the day. THIS POST CONTAINS AFFILIATE LINKS MEANING IF YOU CLICK ON ONE AND MAKE A PURCHASE, THIS BLOG MAY RECEIVE COMPENSATION, AT NO ADDITIONAL COST TO YOU. PLEASE SEE THE POLICY PAGE FOR FULL DISCLOSURE. ADDITIONALLY, THIS BLOG RECEIVED PR SAMPLES OF PRODUCT TO USE IN THIS POST. Obviously, butter coffee has butter in it. I always use a high-quality, grass-fed butter, because it has a higher fat content and generally tastes better than say, a grocery store brand butter. I used Vital Farms unsalted butter. Sometimes I used salted butter, I can’t really tell the difference, but many people can. It’s your call. The other component in butter coffee is MCT oil. MCT stands for medium chain triglyceride. This article goes into quite a bit of detail about MCTs. MCT oil is often derived from coconut oil, so you can use that in place of MCT oil if you wish. I prefer MCT oil because it doesn’t taste like coconut. Additionally, MCTs come in a powdered form. I have not tried this, but I bet it would be useful to add to my post-workout recovery shakes. I have also started adding powdered collagen peptides to my butter coffee. Collagen is great for hair and nail growth, plus it helps with joint health. I workout in my living room (concrete floor) or I run and both are tough on my joints. Since I like my knees and ankles, I will do what ever it takes to keep them healthy! The most important part of this is the flavor though! 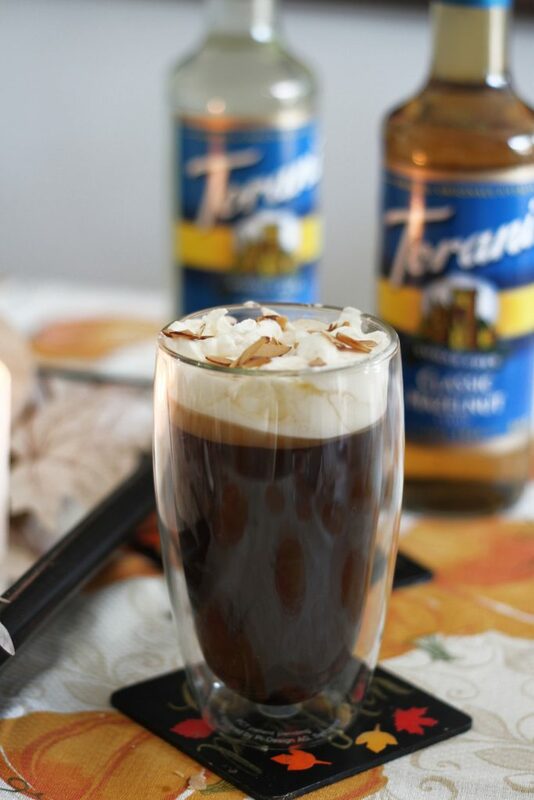 I have a slight obsession with Torani Sugar Free syrups, and adding a splash to my butter coffee makes it taste light dessert without adding carbs or calories! The Torani Sugar Free White Chocolate is my new favorite flavor (I used to be obsessed with the Torani Sugar Free Irish Cream.) 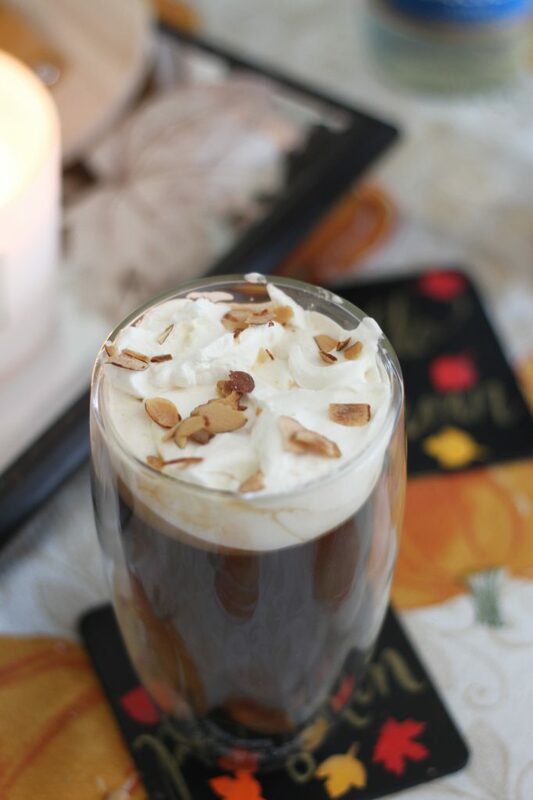 To make it taste like fall I added a little bit of the Sugar Free Hazelnut syrup…um, it takes like falling leaf, sweater wearing heaven! 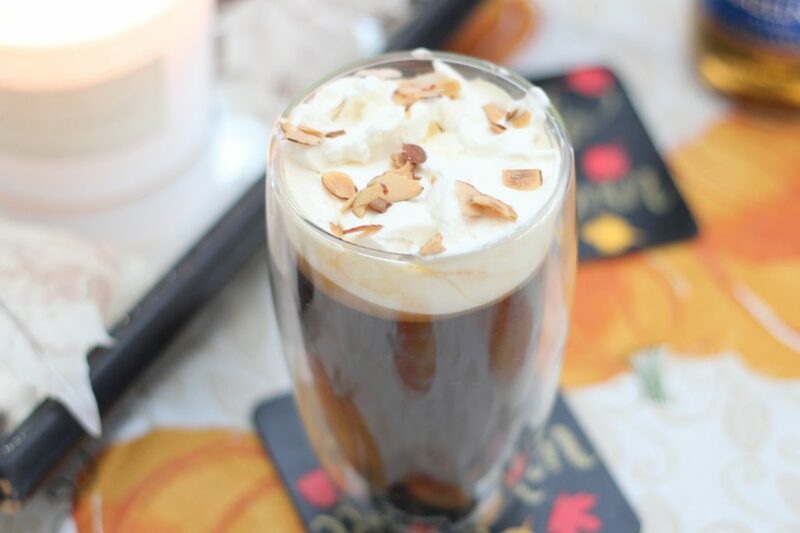 You’ll need a blender or an immersion blender for this Sugar Free White Chocolate Hazelnut Butter Coffee. Oh and your favorite freshly brewed hot coffee. Make it strong! The double walled tumblers used in the photos are awesome for hot drinks. They are Bodum Double Walled Pavina Glasses. Add hot coffee, MCT oil, butter, collagen proteins and syrups to a blender or the cup that comes with an immersion blender. 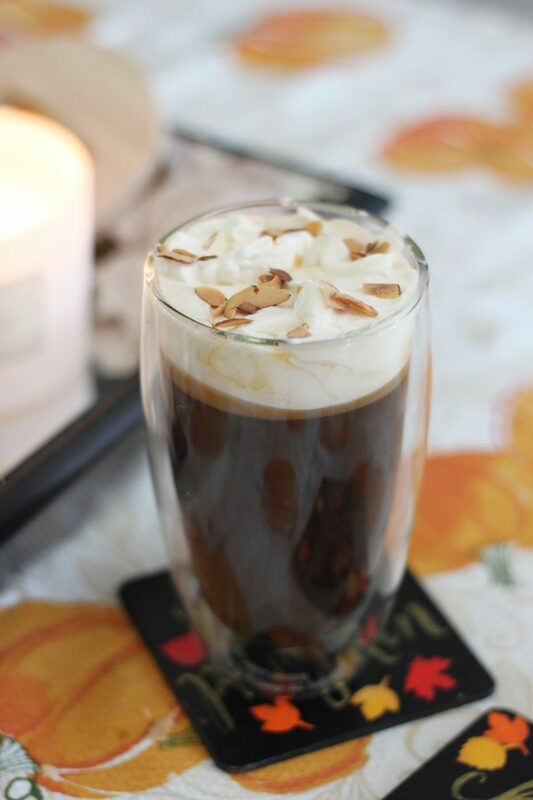 Top with whipped cream (lightly sweetened with Swerve or your preferred sweetener) and toasted almond slivers. Nutrition count does not reflect the collagen proteins or optional toppings. If using MCT oil, start with one teaspoon and work up to one tablespoon. What a great recipe. 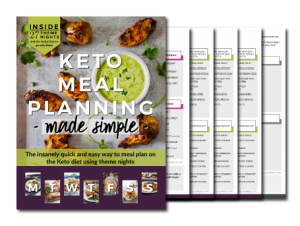 I would like to invite you to share at our party at https://www.farmhouse40.com/inspire-me-monday-196 I know my readers would love this project. Hope to see you there. Ummmmmmm…YUM! Wow I can not wait to try this recipe! Thanks for sharing! Amazing! I need this in my life for sure! Thanks for bringing your recipe for buttered hazelnut coffee to Fiesta Friday. IT looks really yummy. Oh my this sounds rich and delicious! Thanks for sharing at the What’s for Dinner party. Hope to see you again at tomorrow’s party. Have a great weekend! Sounds delish! Thanks for sharing with SYC. This looks so good and tasty! I can’t wait to try this one! Thank you so much for sharing this!